This newly built 3 bedroom house sits at the edge of the picturesque village of Tar whose traditional stone houses cascade with flowers during the summer months. Being close to the vast playground of the Adriatic coastline there are nearby opportunities for swimming, windsurfing, water skiing, diving, table tennis, volleyball, go-carting and horseback riding. 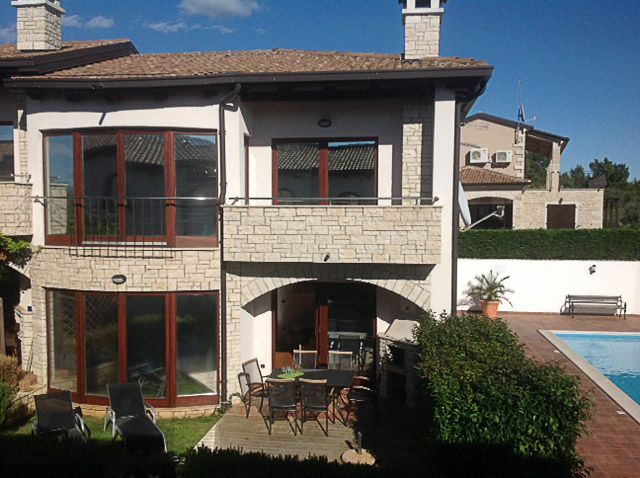 In addition the house is well positioned as a base from which to visit the famous Roman towns of Porec and Pula, the medieval hill top villages of Motovun and Groznjan, the Venetian built promontory of Rovinj and the Austro Hapsburgian town of Opatija. Great location to explore from!!! Great property on the inside, fab pool! Terrace outside too closed in, but this can be overcome by sitting on the upstairs balcony or by the pool. Great base to explore from! Our holiday in August was very nice. We spend our time in house Katharina in Tar. The location was very quiet. The house is in a good merchantable quality and modern equipped. We used the pool beside our house fast every day. We often used the Grill corner in our backyard . All the rooms are very clean. We may enjoy our holidays every day. We had good shopping options. The restaurants in Tar are also good. A highlight was to get the entrance card for Lanterna Beach Resort. So we will spend our next holidays in Tar again. Hi Caroline. Sorry to be so long in writing a review. As it is now raining outside we remember our lovely sunny days in Istria last summer!! The house was perfect for us, 2 adults, 3 children. We were a bit worried that the pool would be crowded but it is huge and a great place for our kids to get to know and play with others on the site while we cooked on the barbecue. Tar is a sweet little village. Good restaurants and local mini market. We thank you for the recommendation for the Lanterna beach resort. We spent many days there enjoying the sea and boats etc. We would love to return one day. Thanks for all your help and advice. 8 Nächte im Juli 2018. Das Haus war sehr sauber und comfortabel. Durch die drei Schlafzimmer und zwei Bäder ideal für 2 Erwachsene mit 3-4 Kinder. Fernseher, Spül- und Waschmaschine waren perfekt für uns. Besonders gefiel uns die direkte Nähe zum Pool, der trotz Hochsaison kaum frequentiert war. Auch der Tennisplatz war sehr gut in Schuss und meistens frei. Von Tar aus waren sowohl Ausflugsziele wie auch Strand prima erreichbar (Voraussetzung: man hat ein Auto). Tar selber ist ein ruhiges Städtchen mit ausreichend Restaurants und Einkaufsmöglichkeiten. Wir waren sehr zufrieden und kommen bestimmt wieder. 8 days in july 2018. The domicil was very clean and comfotable. The three bedrooms and two bathes were ideal for 2 adults and 3-4 children. TV, deashwasher and washingmachine were perfect for us. The direct port to the pool was excellent, especially the fact, that although it was summerseason, less people used it. Also the tenniscourt was in a good condition an almost every day available. Tar is a good startingpoint for various trips to cities like Novigrat, Pula, Porec and Rovinj also to the beach (but you need a car). Tar itself is a small and nice village with some restaurants and enough possibilities to go shopping. We had a perfect stay und will be back soon. At the end of the village of Tar, a few minutes from the Adriatic sea, 10 minutes from Porec, 10 minutes from Novigrad, within walking distance of shops and restaurants, on site tennis court, the property is an ideal spot to both relax and base yourself for day trips. CANCELLATION POLICY: a. The 25% deposit is non-refundable b. If cancellation is made more than 45 days before arrival, then no further fees are payable c. If cancellation is made less than 45 days before arrival, then full rental fee is forfeited. (In the case that we are able to re-let the villa, then a refund may be negotiated) You should arrange your own travel and cancellation insurance.